I don't know about you but spring is one of the busiest times of the year for me. Weddings, events and parties start to fill up my calendar and I'm left searching for new outfits for each thing. Given the current trends however, it's almost easier now to find a variety of great outfits to buy that you can wear again and again. Jumpsuits, rompers, maxi dresses, mini dresses or even a dressy pair of shorts or pants can work, depending on the event. I usually buy one expensive item, then a few affordable ones to get me through the season. rue21 is one place to get trendy pieces at a really great price point, especially if you want to try a new style that you haven't tried before. Jumpsuits/playsuits/rompers: As long as the fabric is dressy enough and it's not too revealing, you can make a playsuits, rompers and jumpsuits work for almost any occasion, except for probably a black tie wedding. To dress them up, I would add a pair of cute wedges or heels and earrings or a necklace. Since the outfit is pretty much the statement because it's a one piece, I would stay away from any bag or jewelry that could overpower it. My favorites are this bow back romper here and this crochet romper here. Maxi dresses: It took me a while to jump on the maxi dress bandwagon but now there's such a nice variety out there that you can find any look you want. A dressier fabric would be great for a more formal event, but a casual fabric can look very put together and polished as well. I could picture a formal maxi at a wedding and a casual one with a jean jacket or sweater at a graduation, outdoor party or beach party. My favorites are this chiffon maxi, this strappy maxi and this printed maxi. Mini dresses: For warm weather or warm climate events, I usually prefer a mini dress. As long as it's not too short or tight, a mini dress can work with any shoes, jewelry or bag and is super easy and comfortable to pack and throw on. I love the fit and flare look, as well as A-line skirts or strapless. My favorites are this sweetheart strapless dress, this lace dress and this spring flower crochet dress. 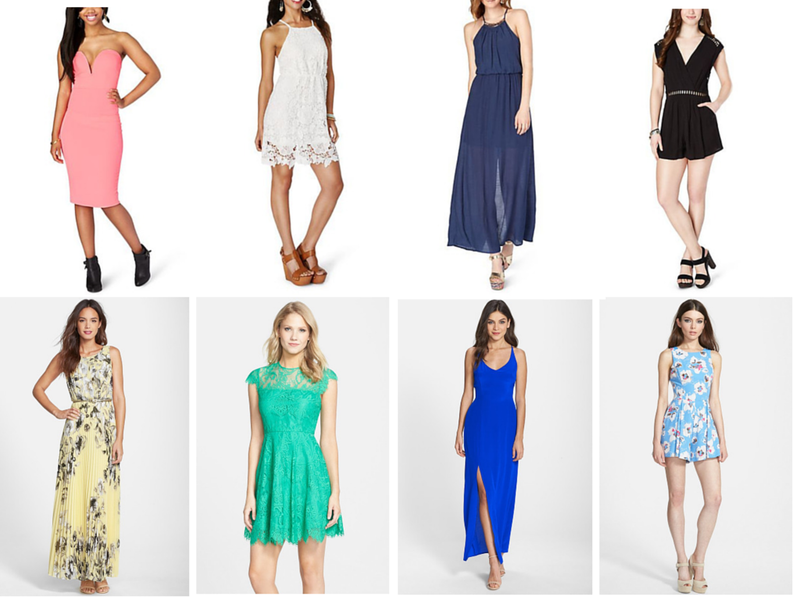 What are your favorite styles for spring parties?